Ranchi Rays pipped Jaypee Punjab Warriors to complete a hat-trick of victories at home. 30th January, 2016, Ranchi: Defending Champions Ranchi Rays displayed spectacular hockey to register their hat trick win on home turf. 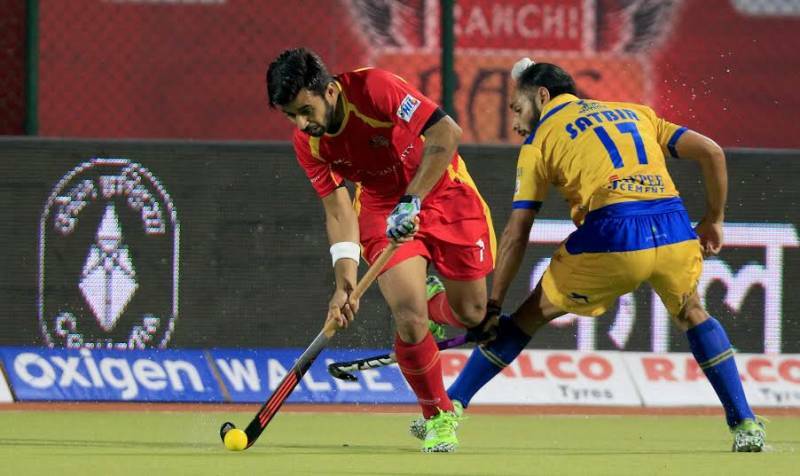 The hosts came from behind to defeat Jaypee Punjab Warriors 5-4 in the 12th match of the 4th Coal India Hockey India League. The match which was being played at the Astro Turf Hockey Stadium, Ranchi saw the hosts enthralling the audience to some scintillating hockey. The win in the match will ensure the Defending Champions stay at the top of the points table with 21 points to their kitty. The first half of the match started with attacking intent from both the teams. The initial minutes of the game saw an aggressive play from the Jaypee Punjab Warriors which was rewarded with a goal in the 7th minute from young forward Armaan Qureshi taking the score to 0-2 in favour of the visiting team. The hosts replied back in the 18th minute scoring a much needed equalizer through a field goal from defender Kothajit Singh. Ranchi Rays continued their pressing game and within 10 minutes they scored again through Daniel Beale taking the lead in the game with a score of 4-2. The ending moments of the first half saw many more circle penetrations by both the teams but excellent work from the goalkeepers kept the attackers at bay. The first half ended with the score at 4-2 in favour of Ranchi Rays. 'The Man of the Match' award of INR 50,000 was given to Kothajit Singh from Ranchi Rays. The Coal India 'Goal of the Match' of INR 50,000 was awarded to Daniel Beale from Ranchi Rays by Shri R.S Mahapatro, Director (Personnel) CCL. 'Hero Emerging Player of the Match Award' of INR 25,000 was awarded to Armaan Qureshi from Jaypee Punjab Warriors, while 'The Most Entertaining Player of the Match' award went to Imran Khan from Ranchi Rays.